On this simulator you will learn the science of utilization of this instrument of measurement, interacting with the instrument, with the fuse or with the contact point (see main components). In this learning object, you can drag and drop the requested instrument to preload, you can also rotate the ‘display’ (by dragging and dropping the ring in a circular motion) so that the ‘zero’ line aligns with the (By clicking on the eye icon) and override the spring effect of the instrument (by clicking on the ‘lock’ icon). There are dozens of dial indicator models in use in the metal-mechanic industry, all of which have in common suitable places to attach them to appropriate devices or accessories. Dial indicator clocks are generally not manual measuring instruments except when associated with suitable handheld devices. 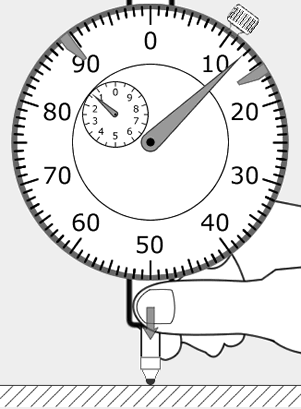 When the dial indicator watch is ‘out of use’, a spring pushes its spindle and the contact tip until the end of the stroke, to take the measurement properly it is necessary to touch the contact tip on the surface to be measured, or the control , And to ‘push’ the watch so as to give a spring load and space for the spindle to go back and forth, without running the risk of the contact tip moving away from the surface or the ‘tap’ spindle at the end of stroke, Forcing the instrument against the fastening device. The preload application makes the pointer of the dial indicator turn, some fixing acessories has devices that allows a fine adjustment, bringing the pointer until the zero mark of the display, however, the dial indicators has a ring that allows turning the display to align tha Zero of display with the main pointer.